It was presented by Justin Briggs, the Founder and CEO of Briggsby, at VidCon London on February 15. Now, I don’t know about you, but I don’t like it when someone I’ve never met shifts my paradigm. So, my initial reaction was to question the methodology that Briggs had used to come up with his counter-intuitive understanding of how the YouTube search algorithm works. But, alas, I discovered that he had looked at 3.8 million data points across 100,000 videos and 75,000 channels. Using a keyword sample that contained a variety of named entities (people, places, things, etc.) and questions (how, why, etc. 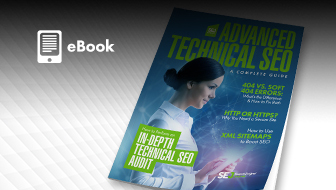 ), he checked the rankings for the first 20 results and fetched a wide array of data through the YouTube API, scraping, and additional analysis. Damn, I can’t find fault with that. So, I finally did what YouTube gurus do when they learn that everything they know about video SEO is wrong, wrong, wrong: I transferred my annoyance and irritation from the messenger to the source. Hey, it would be nice if the world’s second largest search engine would update their YouTube creator playbook for brands, which was published back in October 2015, or had someone like Google’s John Mueller, who would share a strategic insight each fortnight with video marketing experts. Thanks a bunch for this cryptic message. Then, I got my hands on a copy of the presentation that Briggs delivered at VidCon London and wrote this post. Now, there were 77 slides. So, I can’t share all of them here. But, I have identified and analyzed the seven most significant findings that overturn conventional wisdom the most dramatically. When I first saw this slide, I had a strange feeling of déjà vu. What Briggs calls “Basics of Keyword Targeting” looks a lot like a slide presented by Greg Markel, the founder and CEO of Infuse Creative, during the video search engine optimization panel at SES San Jose 2008. You could have knocked me over with a feather. 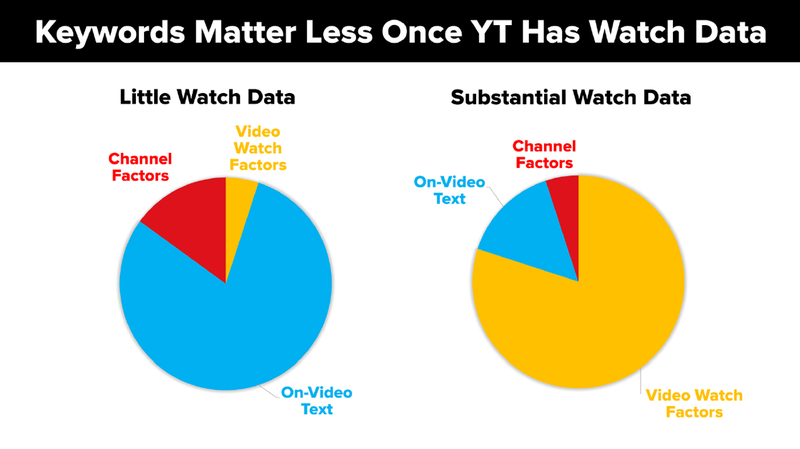 When YouTube replaced “views” with “watch time” in its algorithm back in October 2012, I mistakenly assumed that “relevance” was now a less important factor – even for new videos. 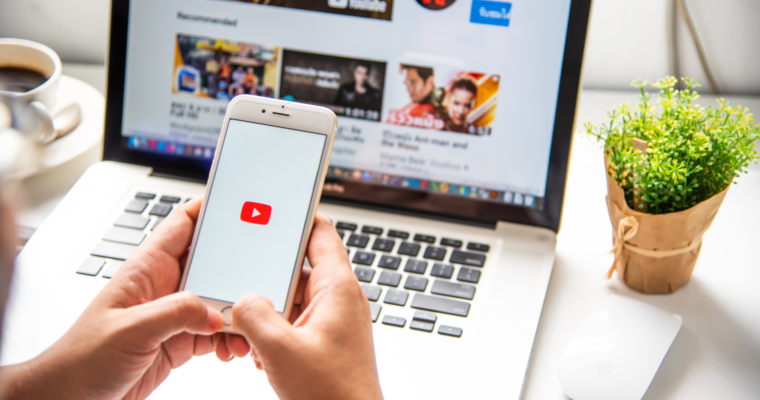 However, Briggs revealed that “relevance” is the most important factor – until a video accumulates enough “watch time.” So, video SEO isn’t dead! It’s sleeping. So, let’s take a second look at it because YouTube is still the world’s second-largest search engine, and it continues to use metadata to index your video correctly and rank it initially. 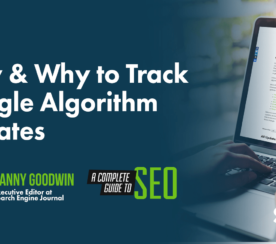 To maximize your presence in YouTube search and suggested videos, you still need to make sure your metadata is well-optimized. This includes your video’s title, description, and tags. 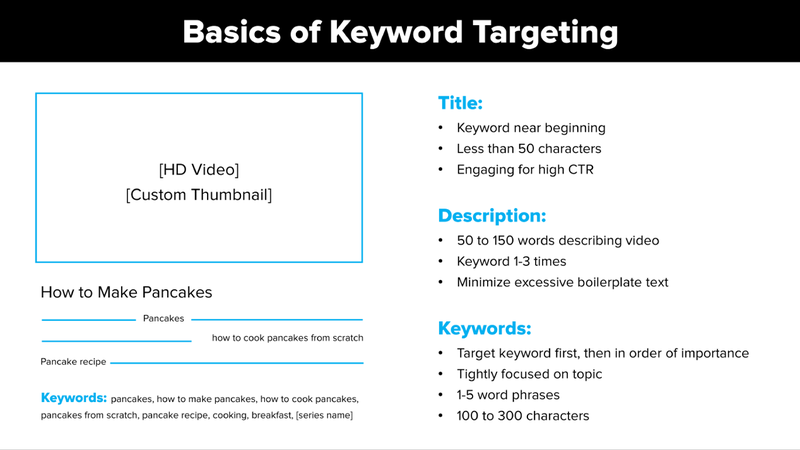 When optimizing your title, put your keywords near the beginning, keep it to less than 50 characters long, and make it engaging for a high click-through rate (CTR). When optimizing your description, keep it from 50 to 150 words long, use your keyword 1 to 3 times, and minimize the use of boilerplate. 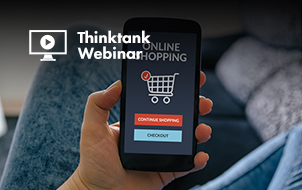 When optimizing your tags, use your target keyword first, then others in order of importance, keep them tightly focused on a topic, use 1- to 5-word phrases, and keep them 100 to 300 characters long. 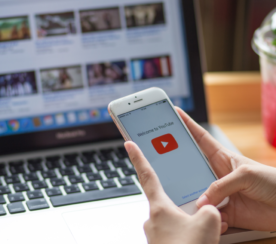 Yes, all this on-video text will become less important once your video has accumulated a substantial amount of watch time, but it will never do that if YouTube’s search and discovery system doesn’t help viewers find your video in the first place. Although tags help get you started, Briggs said that they have little benefit after 3 months. However, he also said that titles are essential. 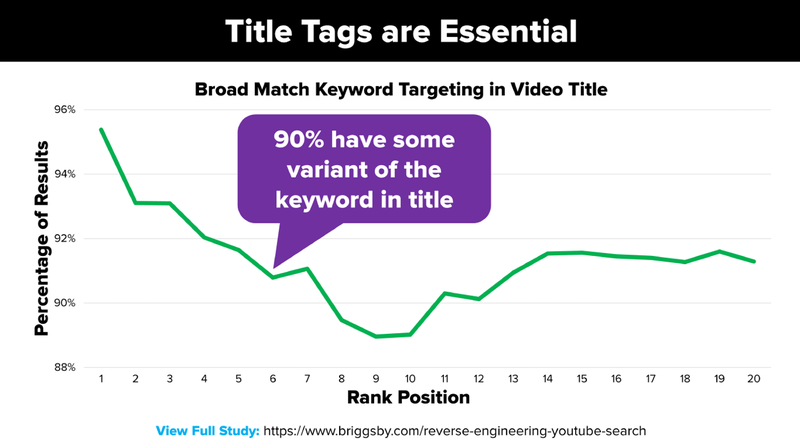 He found that 90 percent of high ranking videos had some had some variant of the keyword in the title. Now, this works if you use compelling titles for your videos that accurately represent the content. While you are at it, you should also create thumbnails that accurately represent your content, too. Why? Because your video thumbnail and title are the first thing viewers see when your video is suggested to them. What’s a short click? Well, if a viewer watches your video for only 8 seconds and ends his or her session, then YouTube’s algorithm figures that he or she wasn’t satisfied with your content. So, what’s a long click? 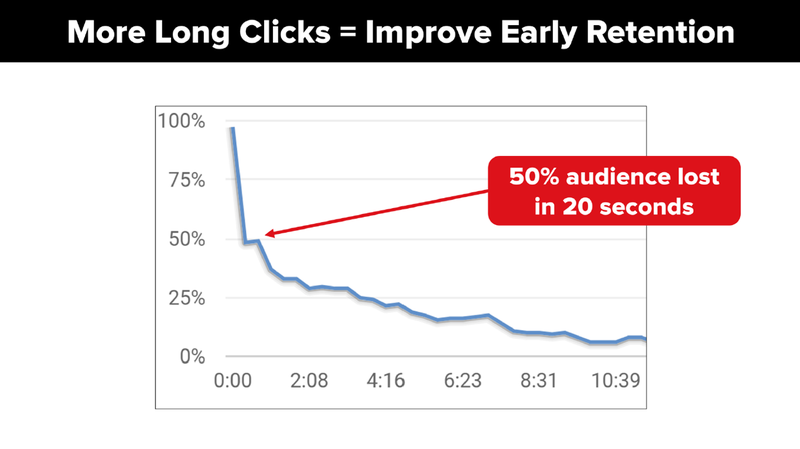 Well, if a viewer watches your video for 2 minutes or longer and continues to watch more videos during that session, then YouTube’s algorithm figures that he or she was satisfied with your content. And Briggs found that 50 percent of the audience is lost in the first 20 seconds. 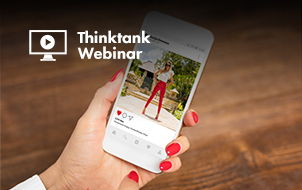 So, how do you improve audience retention? In other words, how do you turn clicks into long clicks? Well, you need to create a compelling opening to your videos and then use the storytelling techniques to maintain and build interest throughout the video. But, it also helps to build your subscriber base. Why? Because subscribers are your most loyal fans, will be notified about your new videos and playlists, and are more likely to improve your early retention and give you more long clicks. And it also helps to engage your audience by encouraging comments and interacting with your viewers. One of the questions that I’m frequently asked is: “How long should a YouTube video be?” I often quip, “Long enough to tell a story.” So, how long does it take to tell a story? 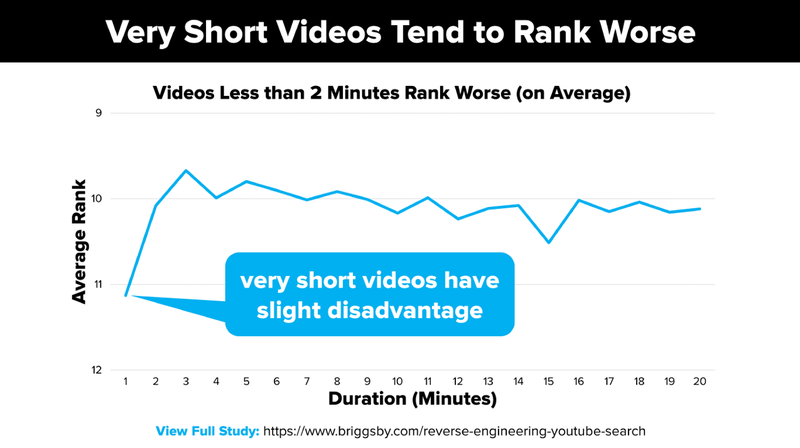 Well, as the slide below illustrates, Briggs took a look at his data and found that videos which are less than 2 minutes long rank worse (on average) than videos that are between 2 and 20 minutes long. Now, watch time is (eventually) an important ranking factor. So, maybe we shouldn’t be surprised that longer videos – if they use storytelling techniques to maintain and build interest throughout the video – generally rank higher than very short videos. 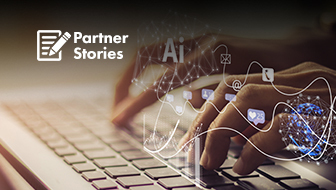 And we shouldn’t be surprised that highly ranked videos get a lot of views – like these six examples of Indian brands winning at video storytelling. Along with metadata being more valuable when videos are first uploaded, Briggs said new videos get a freshness boost, as well. 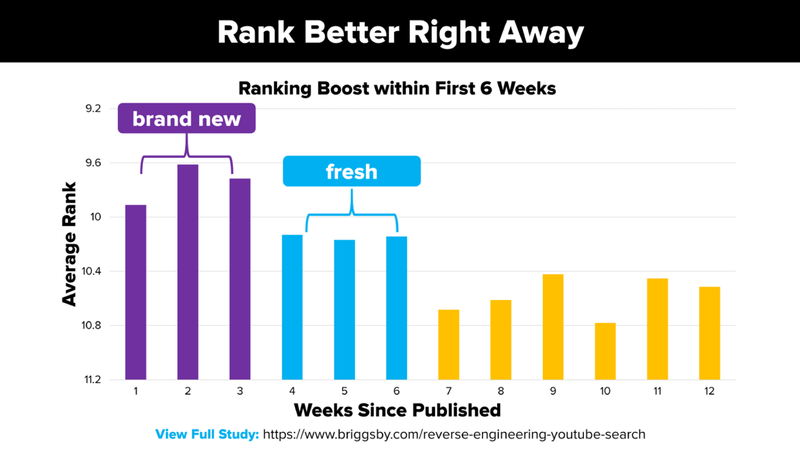 As the slide below illustrates, a brand new gets a significant boost in the first 3 weeks and even a fresh video gets a boost in weeks 4 through 6. This means you need to increase your upload frequency to take advantage of the freshness boost for new videos. So, if you’re currently uploading a video every 3 weeks, then consider uploading a brand new video every week. And if you’re already uploading a video every week, then consider uploading a brand new video on Monday, Wednesday, and Friday each week. If this seems excessive, then consider this: With 5.0 billion views on YouTube in 2018, Samsung was just named the top global brand in Tubular Labs’ VideoAces Awards. How did they achieve that? Well, they uploaded 5,318 videos in 2018 – which is an average of 102 a week. Now, they uploaded localized videos in 50 different countries. So, even if you just look at the 204 videos the brand uploaded in the U.S. in 2018, Samsung still uploaded an average of 4 new videos a week to YouTube. Briggs shared another counter-intuitive finding from his study: Views from embedded videos are of equal value to views on YouTube. 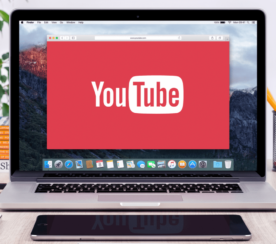 He did add this caveat: Embedded YouTube videos do get watched, but don’t generally lead to longer sessions because viewers are less likely to watch a second video. The way to solve this problem is to embed playlists that carefully craft them so a related video plays next. Now, I have to admit that I wasn’t shocked to find that views from embeds are of equal value. Several years ago, I advised SonoSite, the world’s leading manufacturer of portable ultrasound technology, to stop making two versions of every video – one for YouTube and an identical one for their website. 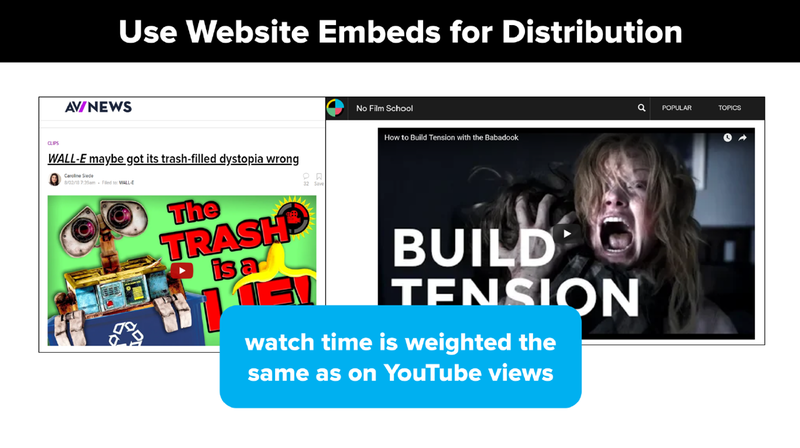 Instead, they started adding YouTube videos and playlists to their website by embedding them. They not only dramatically increased their views on their YouTube channel. They also cut their production costs in half. So, why do I think this advice from Briggs overturns conventional wisdom? Because most companies are organized in silos – and conventional wisdom advises everyone to stay in their lane. That’s the video people rarely talk with the website people, let alone work collaboratively with them to embed videos. Briggs went beyond his own study and cited data from JumpShot, which says there are 15 times more searches on Google than YouTube. And he cited data from Rank Ranger, which says that YouTube videos rank on 20 percent of Google keywords. And he cited JumpShot again, which says 2 percent of all search clicks on Google go to YouTube. Now, the type of video results in Google can vary from a suggested clip to a video carousel to an embedded video. And the Google and YouTube algorithms differ. 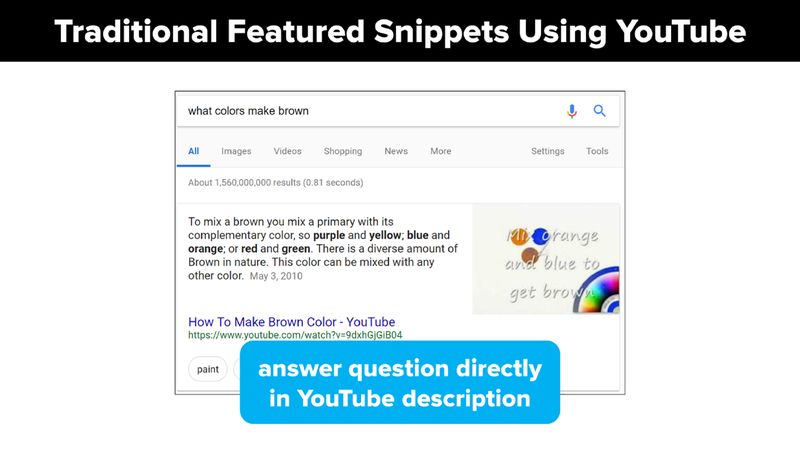 But, according to SEMrush, when YouTube ranks in Google, it gets a featured snippet on 5 percent of its keywords. 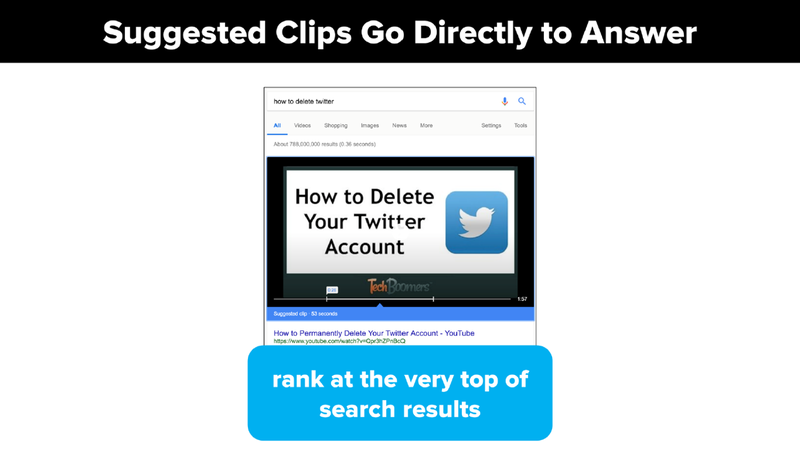 He also showed the example of a suggested clip below. And he advised creating videos that go directly to the answer to rank at the very top of results. Damn, don’t we all wish that we could get lucky?